Mike Boyle doesn’t leave much room for leisure time these days. When he’s not doing his almost nightly play-by-play broadcast for the Spokane Indians, he’s calling the hockey games for the Spokane Chiefs. And when he’s not on the radio, he’s most likely trucking around a news camera, grabbing footage of state tournaments, Gonzaga basketball games or whatever else KREM-TV sends him out to do. But balancing three jobs isn’t Boyle’s toughest challenge. Between television news and radio play-by-plays, Boyle is trying to navigate himself through parenthood while raising his two young sons – 7-year-old Patrick and 2-year-old Jackson. “They’re a handful,” Boyle said. Having a couple of kids hasn’t made the grind any easier, but Boyle said his family, including his wife, Shelly, has certainly kept his life in Spokane happy and busy. Boyle started his journey in Spokane sports 17 years ago when he joined the KXLY team as a weekend sports anchor. Two years later, he was offered a job as the voice of the Western Hockey League’s Chiefs. That same year, Boyle left KXLY and went to KREM, where he has continued to work part time as the station’s utility player – he anchors, produces newscasts, reports for the sports desk and gets behind the camera when he needs to. Although he enjoys working for television news, Boyle admitted that his passion is calling games on sports radio. Boyle has roughly 25 years of play-by-play experience. He began calling games in 1991 at Boise State and for the local high schools in southern Idaho. He took gigs with nearly every sport, including basketball, track and field, and even gymnastics. In 2007, Boyle became the play-by-play announcer for the Tri-City Dust Devils baseball team, which is now the Class A affiliate of the San Diego Padres. For four summers as the voice of the Dust Devils, Boyle left his home in Spokane and traveled to Pasco where he lived in a trailer at an RV park. Once the Tri-City baseball season came to end in September, Boyle would pack up his things and head back home to Spokane. In the offseason, Boyle reported for KREM and called the Chiefs games in the winter. 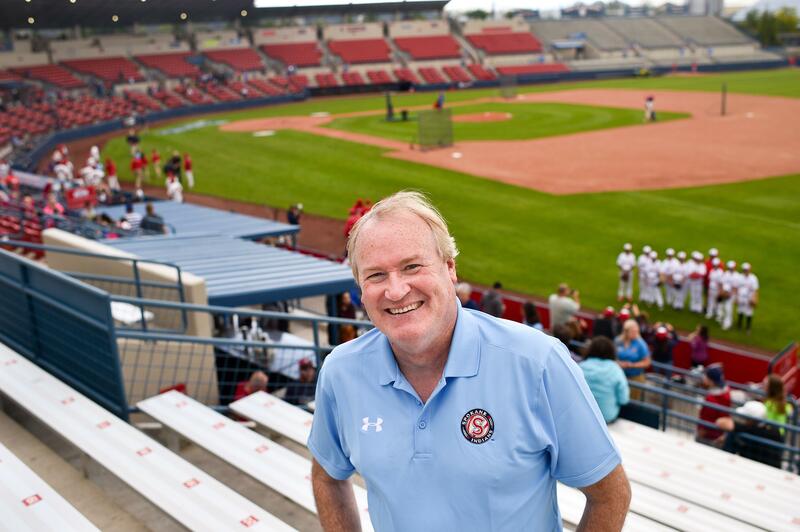 Boyle finally had the opportunity to work in Spokane year-round again when Hall of Fame broadcaster Bob Robertson stepped down as the voice of the Indians in 2011. Boyle immediately interviewed for the vacant position and was eventually named the new voice of the team. He was already familiar with the Indians since he occasionally filled in for Robertson when needed. Boyle even called the Northwest League championship game in 2008 when Spokane won its last title with a 3-1 win over Salem-Keizer. It was the only time Boyle had ever called a championship game winner. “My teams never won until I had to back up somebody,” Boyle said. When the Indians are done playing for the summer, Boyle picks up where he left off with KREM, and prepares for the Chiefs in the winter. Boyle said he has thought about changing the game up a bit. He sometimes wonders about leaving news and eventually just doing play-by-play for one team at a higher level. If that opportunity presented itself, Boyle said he would have a hard time turning it down. But the hardest thing would be deciding on just one sport to call. Hockey is quick, energetic and unpredictable, and calling the game is always fast-paced and exciting. “You feel like an auctioneer sometimes calling it,” Boyle said. Baseball, on the other hand, gives Boyle the chance to delve into the sport, analyze the plays and talk about the game’s history. For now, he’ll keep up his balancing act in Spokane. Boyle said with a young family, bouncing around three jobs can get hectic at times – but he loves every moment of it. “If anyone has a more ideal job than me, I sure would like to talk to them because I really love what I do,” Boyle said.